New Sprouts play food collections from Learning Resources are a fantastic range of toy food sets for young children to play with through imaginative and role play. There are many exciting food sets in the range including Garden Fresh Salad Set, Baking Set and Super Sandwich Set. We were sent the Grill It! My very own barbeque set to try. 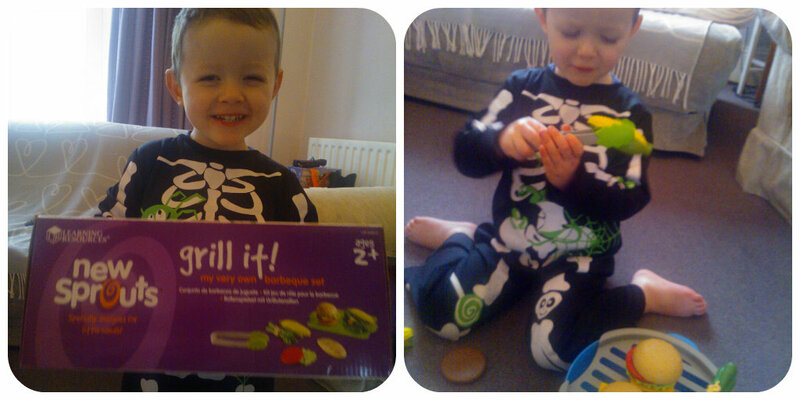 Mister B who is 3yrs old, was very excited when it arrived and was eager to play with it. 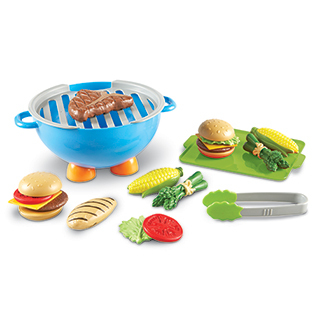 The set consists of a barbeque with lift off grill, tongs, tray and 15 pieces of play food including burger rolls, burgers, tomato slices, a chicken breast, corn on the cob and more. The first thing I noticed about this New Sprouts play set is that the play pieces are very well made. The food items are a lovely quality and look good. The barbeque is a flexible plastic which is great as it helps to avoid any breakages making it a toy that will last and withstand a not so gentle toddler! As well as having fun playing with the barbeque set, it is excellent for improving fine motor skills and hand eye coordination. Mister B who is 3 initially found the tongs a challenge to use, but after a few go’s, he got to grips with using them. You can see his little mind ticking over working out how far down the tongs to hold them in order to get the best grip. 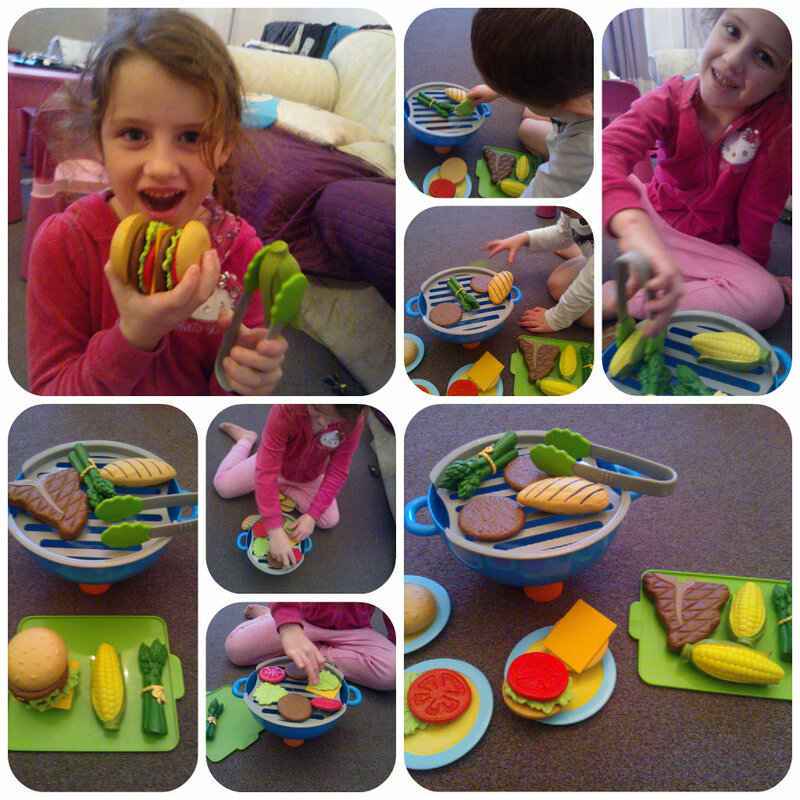 Both children loved playing with the set to cook each other food and make different burger combinations. This set will provide hours of fun and easily combines with other food/kitchen play accessories they have to provide long term play value. They love to use the barbeque when playing picnics, or having a pretend cafe etc. The New Sprouts Grill It set is a great, brightly coloured set that little ones will love. My two love playing with pretend food and the barbeque gives them something to cook on. It also gives great interaction with parents as Mister B loves asking what I want and then cooking it for me. Although he is a bit cheeky and I usually get what I’m told to have rather than what I ask for!! We loved this set and recommend it as a great play set for toddlers who love to cook.